It’s hard for me to believe, but I’ve agreed not to take my computer away for the holidays! So we’ll be back in early January. Enjoy your silly season, regardless of how you choose to celebrate your wonderful rainbow family. What are your experiences with health services? I was interviewed last night by a professor of paediatric nursing from Curtin University in WA. They’re doing research into rainbow families’ experience of health care service providers.She asked a bunch of questions about my family and my family of origin, and then about interactions I’ve had with health service providers, both for myself and seeking health services for my children. I felt a little boring as I haven’t had any negative experiences from health service providers, although obviously it’s important for researchers to hear positive stories as well. Elisabeth and I have only had respectful, delightful interactions with the doctors, nurses, obstetricians, lactation consultants, dermatologists, opthalmologists and paediatricians with whom we have had interactions so far. If anything – and I presume it’s just part of the comforting patter – they tend to go in the other direction and enthuse about how wonderful it must be for our children to have two mothers. I don’t know if this is the case for everyone, so I’ll be interested to see the results of the study. We are educated, assertive, middle class women. We live in a capital city. We have the resources to shop around if we feel we are not getting good services. And we are quite confident in our sexuality and our parenting – we’re not closeted and we don’t feel we are compromising our children by bringing them into a family with two mothers, so we are not open to being made to feel guilty by other parties. Between visiting family in Melbourne and a group holiday with other lesbian families on the Sunshine Coast, I’m away for the next couple of weeks. For your holiday reading, I’m going to cut and paste other great posts I find around the net. Here’s an oldie but a goodie, from US site Mombian. Our immediate family is made up of me (Sonja), Rosie (8) and Ari (1). Then there are our fairy godparent and biological families. The biological one is quite conventional (and a bit conservative with some Christian-right elements) but the fairy family more than compensates! They are a whole bunch of friends (and Ari’s donor and his boyfriend) who have a ‘special’ relationship with me and the kids. Rosie was conceived in an unsuccessful attempt at a straight relationship. She still spends around half her time at her dad’s house. Ari was conceived with the help of a very old gay friend… and an intimate relationship with a collection of syringes. Do you have a relationship with your donors? What’s the current favourite activity of each of your children? Ari – inspecting the bolts and wheels on high chairs, prams etc. and/or climbing up and down steps, always resplendent in borrowed jewellery! What’s your favourite thing to do together as a family? What are some great kids’ activities where you live? Rational, flexible, compassionate… and, from time to time, stressed! How do you feel being a ‘rainbow family’ influences your parenting? We have many discussions about ‘difference’, equity, and perspective. Rosie is known to her peers as an activist… when they made ginger-bread houses for Christmas last year she boycotted because they were using Arnotts biscuits (palm oil) and Nestle smarties (third world distribution of infants formula). I had to do an emergency run to the shops in search of ethically produced Australian equivalents. Single parenting is difficult. Have you found any issues particular to queer single parents? Probably just the issue of being invisible (as Queer) and/or presumed straight. When I finally got pregnant it was almost a relief to have a casual excuse to out myself when people asked about the baby’s ‘dad’. Anything about rainbow parenting you didn’t expect? If you started all over again, is there anything you would do differently? I’d rather not be dealing with ongoing family court sagas with Rosie’s dad. However, Buddhism has taught me lots of strategies for ‘letting go’… and probably I’m a better parent as a result. How have your extended families responded to the creation of your family? How have you responded to that? 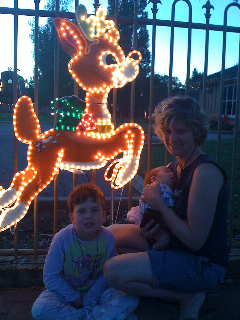 Now they love the baby to bits…. although I suspect they avoid explaining ‘where he came from’ to their kids. Though I try not to, I still resent that… I see it as passive homophobia. When the opportunity presents I daresay I will endeavour to be honest about who I am… whilst trying not to offend the kids’ Christian sensibilities. How do you explain your family if outsiders ask? How do you respond when people assume heterosexuality? Initially they didn’t understand why I wanted to have a second child and the way I wanted to go about it. I got involved in many extended conversations that justified my decision, even when I didn’t feel like I should have to explain. If I were in a straight relationship nobody would question my desire to have a second child. Being perceived to be straight is even more challenging to my own sense of identity. I’ve found myself getting dykey haircuts and wearing provocative t-shirts as a kind of compensation… but I’m also able to see how ironic this is! How can ‘passing’ as straight compare with the phenomenal threats to identity and huge scary decisions about visibility/invisibility that trans people have to make every day? Have you experienced any difficulties as a rainbow family? This has become even more complicated recently, since I’ve started ‘dating’ a trans guy. Even for this Queer readership I feel the need to explain – female to male. I have had several more nuanced and complex conversations about gender with Rosie… and also had to explain that, even though we see no issue, it’s possible that some other people may not ‘agree’. I’m struggling with this, because effectively I’m asking her to be ‘sometimes silent’… something I’ve come to hate. What supports (rainbow or straight) do you recommend? Hanging out with other ‘pink parented’ families helps put things into context. I’ve often been surprised to note that, despite our many similarities, our differences as parents/kids/families are just as complex and numerous as any other small cross section of the wider community! How do you model pride in rainbow families to your child/ren? What advice would you give someone embarking on a rainbow parenting journey? With the UN Climate Change Conference struggling along, I’ve been thinking, rather despairingly, that I’m misguiding my energy working towards my children’s parenting security when I can’t even guarantee my children a planet to grow up in. That seems pretty basic. Elisabeth has just finished the harrowing The Road by Cormac McCarthy and we’ve been wondering what we can do. It all seems so big. green loans – 10000 bucks interest free, people! and of course, the state of the world that the twinkle and her kids will live in. My head has been filling with ideas on how we can lessen the impact we have with our lifestyle and I’ve finally decided to put them all in one place, categorised, in public, to challenge me to go ahead and deal with them instead of just thinking about them. So here goes. There’s lots of things that we already do, and there’s plenty more we could improve on. There’s more stuff that needs to be on that list that I have forgotten in my big brain dump just now. I will add them as I remember or learn them, and I plan to talk myself through it on my blog. Readers, I’d love to hear your ideas on what you are doing or could do more of to green your children’s future. 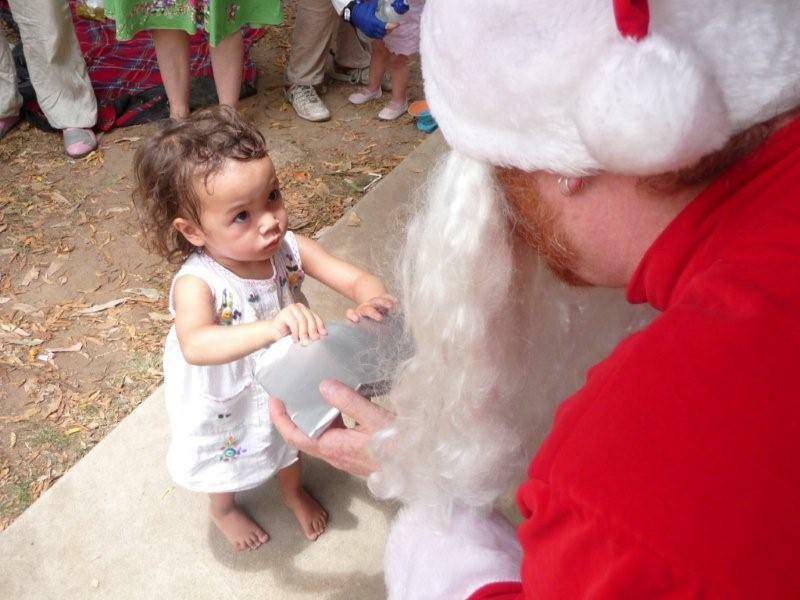 Yesterday in Brisbane, Santa made time in his busy pre-Christmas schedule to drop in on the (second) annual rainbow families Christmas picnic. There were about thirty families there; mostly mothers, but some grandmothers, donors and assorted ring-ins. 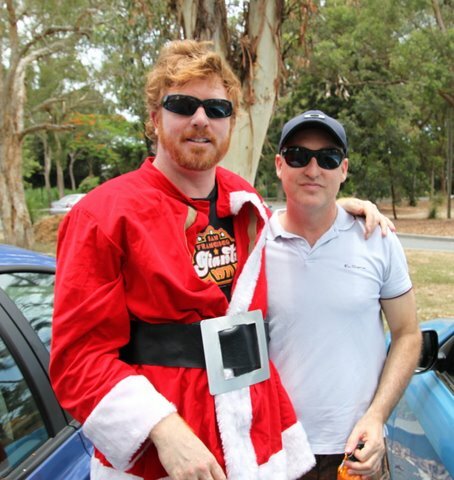 It’s a delight seeing my children respond to it from year to year – this year they were really engaged with the races, and quite excited about seeing Santa, although they didn’t know who he was or what he did – just that ‘Santa’ was something one was meant to get excited about. At this time of year, difference from the mainstream is highlighted. The representations are Mum, Dad and two or maybe three angelic blonde children. Hale and hearty grandparents who are clearly still married to each other look on adoringly- no messy running between divorced grandparents between breakfast and dinner. From the marketing, I would assume that stepfamilies, separated families, single parent families, people with disabilities, non-Anglo families and gay families don’t celebrate Christmas. 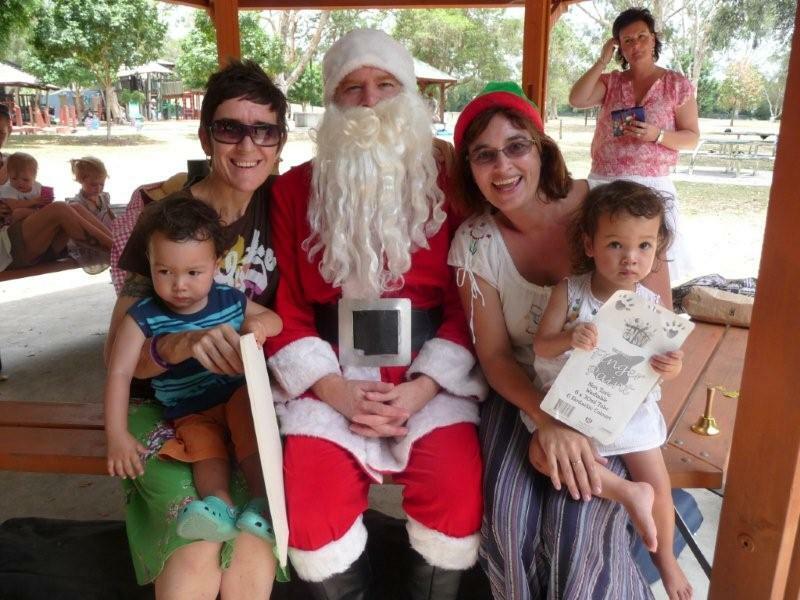 It seemed important to me to start up a Rainbow Families Christmas Picnic. As my children get older and understand more, Christmas will become more and more heteronormative. Advertising that convincingly reproduces gender stereotypes. Mr & Mrs Claus. Years and years of soppy Christmas special movies yet to come! We’re all gathering to celebrate the quintessential nuclear family – the Virgin Ideal Mother Mary, the macho, protective, strong silent Joseph, and the perfect baby Jesus, ‘no crying he makes’ (how did they know when to change his nappy?). I want my kids to have a moment where they can stop and say, ‘Look, here are a whole bunch of families like mine, all celebrating Christmas’. Do you feel a need to queer Christmas? How do you make Christmas an event that includes our children? That celebrates families – all families? At the time of year when family is exalted to ridiculous, unsustainable heights, how do we deal with our messy networks of relationships? Or are you happy to accept Christmas for the odd hybrid of sanitised religiosity and rabid consumerism it offers? Radical Christians suggest that Jesus himself lived in an unconventional family as an adult – living unmarried with Lazarus, Martha & Mary would have been highly scandalous at the time. Jesus had two dads, and look how he turned out! We created our primary family using commercial surrogacy in the US. Our son was born 3 years ago in Ohio, USA. Do you have a relationship with your donor/surrogate? We have a strong relationship with our surrogate, Kelly, and her family. We are in contact regularly and we have been to visit them in Ohio. We don’t have a relationship with the egg donor as she was essentially anonymous. What’s Ethan’s current favourite activity? Visiting the park, the zoo and the aquarium. Drawing on the lounge room wall although the adults aren’t so keen on that! Our family is and will continue to be an open, honest and accepting family. Being a rainbow family also means traditional stereotypical roles are gone. How has your relationship with your partner changed after children? Yes, we have grown stronger as a family unit for sure. No. It is just parenting. It’s not always easy but being gay doesn’t alter it. How have your extended families responded to the creation of your family? They have always been and continue to be perfectly fine with it. Even Jeff’s family which is a traditional Chinese (Taiwanese) family. There has never been any issues except the usual things like grandparents offering advice. We just say Ethan has two dads. If they enquire more we tell them he was born via surrogacy. So far no one has really assumed heterosexuality! But if they did, I would probably assume homosexuality in return….that usually makes people think about their assumptions. To be honest, we haven’t. Maybe because we live in Melbourne. But we have never experienced any difficulties. The exception is legal however. Unlike lesbian co-parents in Victoria and other states who can now have their parenting role legal recognised, surro-Dads are still in legal limbo. Despite that we travel quite easily in the world. Are there issues particular to gay men as parents? The only issue is legal recognition, which is sadly missing in Australia. Surround yourself with friends and family who support you. Get rid of those who don’t. Don’t let you children grow up with those who don’t support your family 110% . That is toxic. If they don’t support you, no matter who they are, they should no longer be part of your life. Make sure you find friends in similar family situations so your children will grow up surrounded by or knowing other rainbow families. How do you model pride in rainbow families to your child? You be proud. It really is simple as that. Be proud of who you are. Be proud of your sexuality. Be proud of the rainbow family you created. Children will learn, respect and adopt that pride. LOL………that is a hard one. OK….creating a rainbow family is much harder than 6 Bacardi Breezers in the back of a Barina at 3am in the morning. It takes time, patience, more time, more patience, more time, lots of money, a rollercoaster ride of emotions, more time…..lots of love and trust. But the journey is worth it. It may be a difficult journey or a long journey but the joy of being a dad or mum at the end of it is worth it. Being a parent is not for every one (gay or straight) but if it is for you…follow that dream. 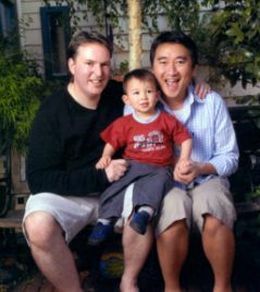 Oz Rainbow Families is a parenting community for gay, lesbian & queer headed families & their friends. Each Monday there's a rainbow parenting post, Wednesdays is a general parenting topic, and Fridays a rainbow family profile. I'm keen to hear from guest posters, so write to mikhela_lee@yahoo.com.au to suggest a topic. 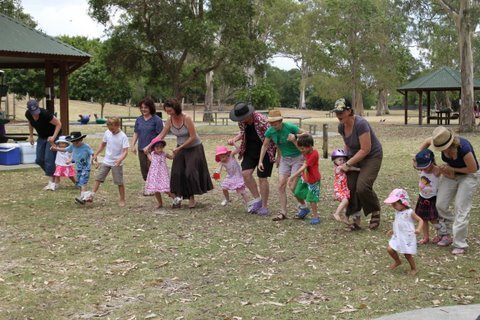 Oz Rainbow Families is on trial until Feb 2010 to see if there's enough interest - I want to connect with other rainbow families, not just post my own thoughts! So if you'd like to see it keep going, leave a comment. To find out more about Molly, see the "About" tag at the top of the page.